Official Spokesman of the PA Security Forces Adnan Al-Damiri exploited the occasion of Valentine's Day to promote the Palestinian Authority's map of "Palestine" that presents all of Israel as "Palestine" together with the PA areas. In Al-Damiri's Valentine version of the map, "Palestine" was made out of hearts. 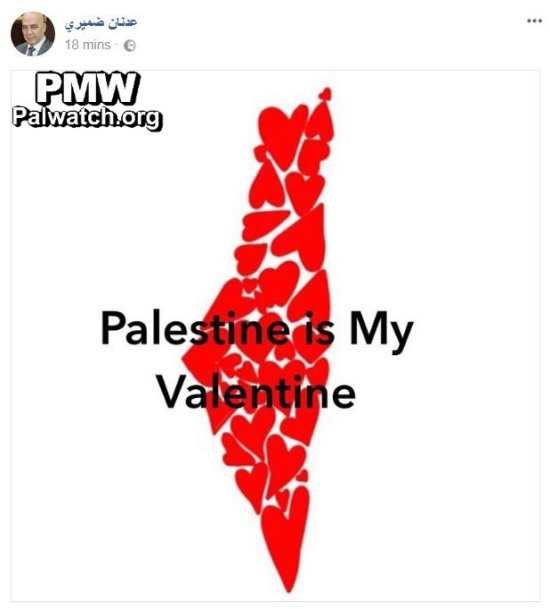 English text on image: "Palestine is My Valentine"
Palestinian Media Watch has documented the PA and Fatah's extensive and sole use of this map that denies the existence of Israel. Among PA officials often seen handing out plaques with the PA map of "Palestine" are PA Minister of Education Sabri Saidam, Secretary of the Fatah Central Committee Jibril Rajoub, and Governor of Ramallah Laila Ghannam. Adnan Al-Damiri is also General Political Commissioner of the PLO Political and National Guidance Authority.